I use a wide range of materials: steel, tarpaper, foam and rubber; non-art, inorganic materials that are meant to retain their industrial identity. I consider myself to be part of a small group of artists who reach conceptual and intellectual goals through a focus on craft. Every element I use to make an object, its scale construction method and choice of material is essential to the way the viewer relates to it. I deliberately use materials that are the conceptual opposite of the image they are part of. My objects feminize these materials; make them industrial, construction-related materials sensual. - 2004 "Wrapped", Garden installation. Center for Contemporary Arts, Dallas, Texas. - 2003 "TAZ", Coleman Contemporary Art gallery, Albuquerque, NM. - 2003 Transformation", Margaret Poissant gallery, Houston, TX. 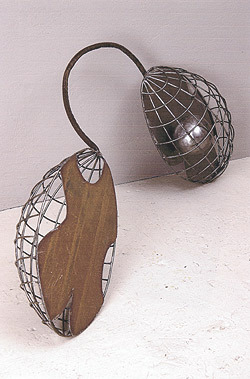 - 2003 Biennial Art Faculty Exhibition, UTSA, San Antonio, TX. - 2003 Drawing Conclusions", New York Art gallery, New York, NY . - 2003 Red Dots & Glam", Blue Star Art Center, San Antonio, TX. 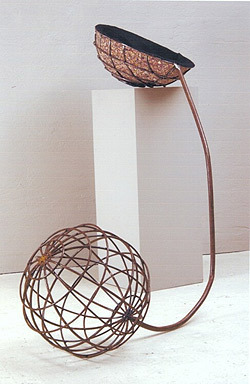 - 2002 "Steel Grrrrls", Johnson gallery, University of New Mexico, Albuquerque, NM. - 2000 "Traps and Lures" Coleman Contemporary Art Gallery, Albuquerque, NM. - 1999 "Macho" Site 21/21 gallery, Albuquerque, NM. - 1999 " Dis-Play-Ing" AC2 gallery, Albuquerque, NM. - 1995 "4Ways to look at the Landscape" Coleman gallery, Albuquerque, NM. - 1994 "Res ipsa Loquitur" Idyllwild Art Foundation, CA.